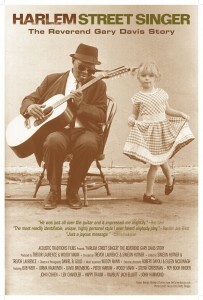 Acoustic Traditions is proud to present Harlem StreetSinger, the first-ever film to tell the little-known story of Reverend Gary Davis, the great ragtime and gospel musician. Tracing his journey from the tobacco warehouses of the rural south to the streets of Harlem, the film is a revealing portrait of an artist who impacted the musical landscape of folk music and endeared himself to musicians such as Pete Seeger, Bob Weir, Jerry Garcia, Jorma Kaukonen, David Bromberg, Bob Dylan and countless others. In addition to interviews, the storyline features audio recordings from Woody Mann’s guitar lessons with Davis, archival footage, rediscovered photographs, concert and informal musical sequences by the Reverend as well as contemporary artists who have been influenced by him. Harlem Street Singer celebrates the beauty and spirituality of his music as well as the human qualities that made Reverend Davis a much beloved teacher and minister. This is the exciting story of an American musical icon whose legacy continues to live on in today’s music scene. visit our News / Updates page.